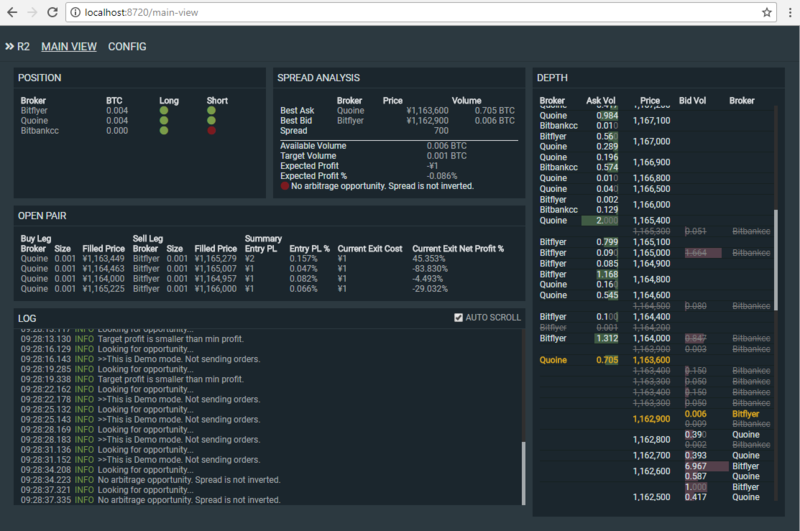 R2 Bitcoin Arbitrager is an automatic arbitrage trading application targeting Bitcoin exchanges. Console mode is for CUI-only environment like Linux boxes with no GUI. R2 supports the following exchanges. BitFlyer margin trading (BTC-FX/JPY) is available as a broker plugin. Every 3 seconds, R2 downloads quotes from exchanges. Filters out quotes that are not usable for arbitrage. For example, if maxShortPosition config is 0 and the current position is 0 for a broker, the ask quotes for the broker will be filtered out. Calculates the best ask and the best bid from the filtered quotes and checks if the expected profit is larger than the configured minimum value, minTargetProfitPercent. If there is no arbitrage opportunity, R2 waits for the next iteration. R2 concurrently sends a buy leg and a sell leg to each broker that offered the best price. R2 checks whether the legs are filled or not for the configured period, say 30 seconds. If the both legs are filled, shows the profit. If one of the legs are not fully filled, R2 tries to send a cover order in order to balance the position. The covering behavior is configurable in onSingleLeg config. After the spread has became smaller than the configured value, exitNetProfitRatio, R2 tries to close the pair. Concurrency: All API calls to exchanges are concurrently sent/handled. ️Dynamic configuration: User can dynamically update the configuration based on spread statistics by a simple js script, like setting minTargetProfitPercent to μ + σ every few seconds. R2 can send notification messages to Slack and LINE when it detects the configured keywords in the output logs. Soon we will be implementing a bot to Telegram and Discord. Installation on your private server. I want a plugin for my favorite Exchange / Broker! Send me a PM and we will negotiate!